I recently switched by blog over from Jekyll running on GitHub Pages, to Hugo running on Netlify. One of the things I investigated was how to schedule blog posts on Netlify. This is, as with most other Static Website Generators, not something which is supported out of the box due to the fact that these websites are not dynamic. The content is created when the static generator runs, so you need some way to re-generate the website at a future date and time to include those future-dated posts. Before we dive into possibilities for future dating posts, let’s take a quick look at how Netlify handles the building and publishing of a website using Continuous Integration. 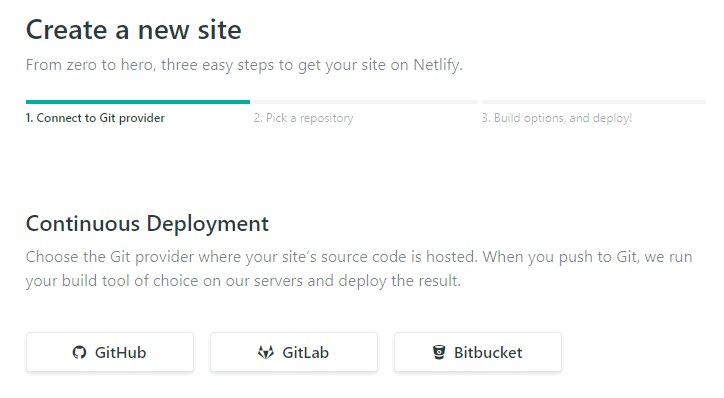 When creating a new website on Netlify you can configure Continuous Deployment by connecting it to a repository hosted on GitHub (or GitLab or BitBucket). Netlify will create a webhook which will be triggered every time you push changes to your GitHub repository. So given you have configured everything else correctly, all you need to do to publish new posts is to push changes to your GitHub repository. When you do that, the webhook will be triggered, Netlify will pull the latest changes from GitHub, build your new Hugo website and publish it. Now let’s look at the two approaches for working with future dated posts. The first approach is one which is commonly used with other platforms as well, and that is to merge a Pull Request at a future date and time. 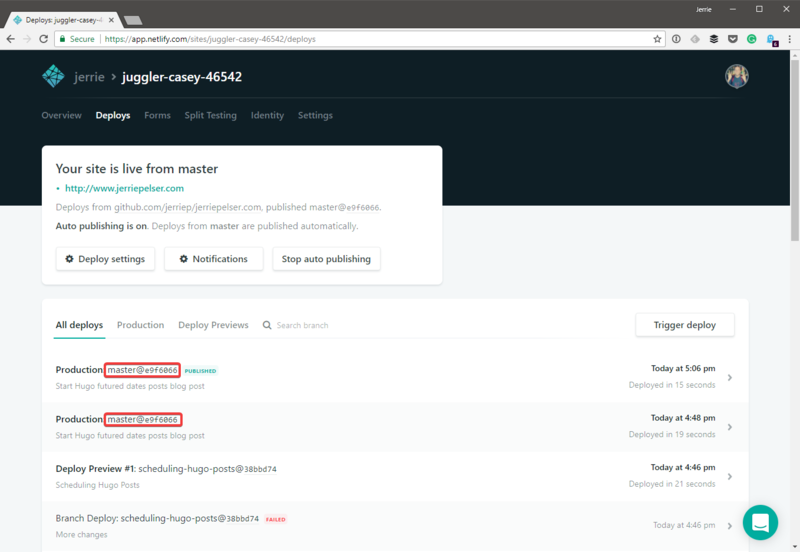 When adding a new post to your Hugo website, you do not commit the changes to the master branch (or whatever branch Netlify is publishing from). Instead, create a new branch - either in the main repository or a forked repository - and commit your changes to that branch. Once you are happy with the changes, you can then create a pull request for those changes to merged into the branch which Netlify is building from. Netlify will build a preview site for the pull request, and you can click on the Details link which will take you to a preview version of the website where you can view the new post. Now all you need to do is schedule for that pull request to be merged at some future date and time. You can use the Merge a pull request endpoint of the GitHub API to achieve this. The second approach is to specify the publishDate front matter variable for a post. 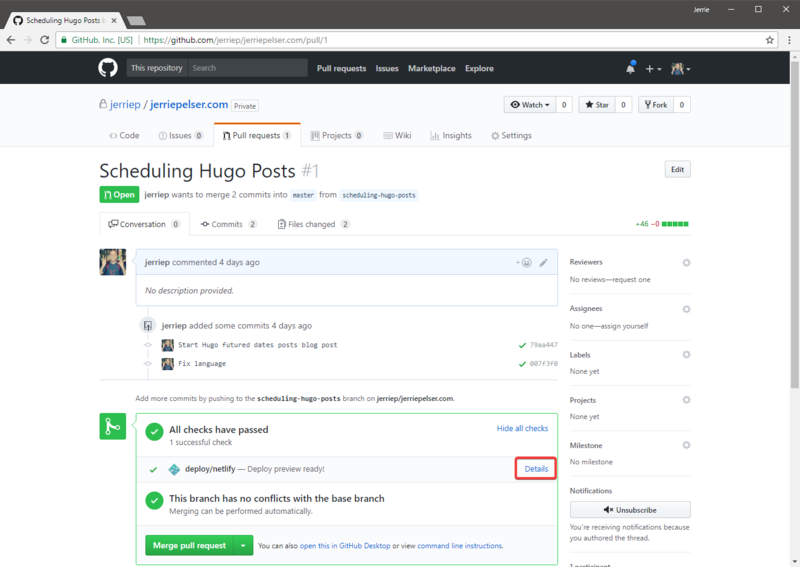 When you do this, Hugo will not include the post in the generated content unless the date specified in the publishDate variable has already passed. I can now commit this blog post and push the changes to GitHub. Netlify will use Hugo to build the website, but because that time has not yet passed, the post will not be included. I will need to trigger the build process in Netlify again to do that. In order to do that, you will first need to determine the registered hooks for the repository by using the List Hooks endpoint of the GitHub API. As you can see in the result above, I can easily identify the webhook which was registered by Netlify by the URL being https://api.netlify.com/hooks/github. Now that I have identified the Netlify webhook, all I need to do is to trigger it, and I can do that by making an HTTP POST request to the URL specified in the test_url attribute above. The first of those two deploys was created when I made a commit earlier. The second one was triggered by making a request to that test_url for the webhook. So now all I need to do come 6PM, is to do that again and this blog post will be published. In this blog post I discussed two possibilities for future posting using Hugo and Netlify. Both approaches are acceptable, though the first one (using the pull request) has the advantage that other people can view a preview of the website with the new content before the pull request is merged. I did not show you actual code of how you would do this, but instead only discussed the possibilities at a higher, more abstract level. Rest assured though that I have tested both approaches and they work. But it is up to you to go and write the code to make this happen!